When you book a Skyline Cruise, you can see some of the most famous sights in the world and have some of the most breath-taking views of the tri-state area. A cruise on our luxury yacht the Skyline Princess can take you past iconic Manhattan landmarks like Gracie Mansion, the United Nations, the Empire State Building and One World Trade Center. You’ll see Liberty Island and get unique views of the Statue of Liberty. There’s a lot to see in the five boroughs of New York City, but we want to call attention to the beautiful borough we call home, Queens. All of Skyline’s public cruises and a large number of our chartered cruises depart from our home port at the World’s Fair Marina in Flushing, Queens. We do offer full ship charters from other parts of the area such as Manhattan, Westchester, New Jersey, Connecticut and Long Island, but Skyline loves our Queens home and we want to tell you why you should too. The Skyline Princess, is centrally located, convenient from Nassau, Suffolk, The Bronx, Brooklyn and Manhattan. We’re near the Robert F. Kennedy Triborough Bridge, the Grand Central Parkway, Long Island Expressway, Whitestone Bridge and Brooklyn Queens Expressway and Jackie Robinson Parkway. 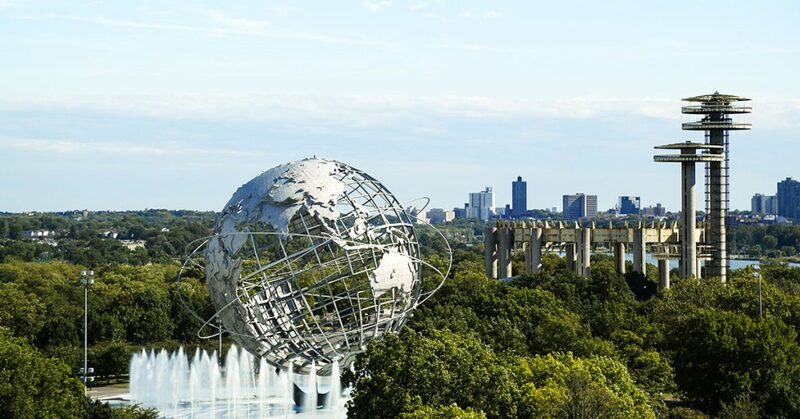 The marina is located in Flushing Meadows Corona Park, the historic site of the 1939 and 1964 World’s Fair. You can also take public transportation to the Marina via subway on the 7 Line. When you’re coming out to the World’s Fair Marina, why not take a look at what’s around? We’re right next door to Citi Field, home of Major League Baseball’s 1969 and 1986 World Champion New York Mets. 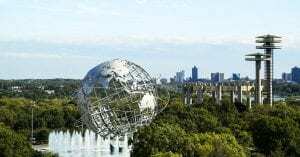 Flushing Meadows Corona Park contains remnants from the two World’s Fairs as well as the Queens Museum of Art and the New York Hall of Science. We are located right next to LaGuardia Airport convenient for out of town guests and travelers staying in the many hotels near the airport. Our Queens location gives you more sights to see and longer cruise times than the other cruise lines leaving from Manhattan. We leave the Marina and cruise through Flushing Bay. Our public lunch, brunch and dinner cruises will head down the East River for spectacular views and photo opportunities viewing the Manhattan Skyline and the Statue of Liberty. We also offer full ship charters and public cruises of Long Island Sound. We’ll cruise the northern shore of Long Island and you’ll see historic forts, mansions and lighthouses along the way. And the Skyline Princess is the perfect place to plan an event or celebration. We host all types of functions from corporate meetings to weddings, Bar/Bat Mitzvahs, anniversaries and school events We can offer you a full ship charter for your event, but if you have a smaller group we can charter a deck on one of our public cruises. Sometimes for events like small weddings, we’ll only rent a table or two. Talk to us about your needs and budget. We offer a variety of packages from cocktail parties to sit down dinners, all prepared by our onboard chefs. There’s a lot going on in Queens! Contact us today.